That’s a quote from this book that is referenced several times throughout, and as I gather my thoughts on how to adequately review this book, that quote comes to mind, as I feel it is a great place to start. To try and define what makes this book so good is like trying to write a song in the key of the wind, (or like trying to paint with all the colors of the wind, for that matter.) As I think about reviewing it, I can’t help but feel a bit like Kevin Costner’s character in Field of Dreams when he is trying to tell the people that want him to sell his farm that he can’t sell it because the White Sox are outside playing baseball in his corn field. The book itself isn’t what’s special. It’s the irresistible truth inside of it that makes it so noteworthy, but even then, it’s a mystery that each reader will have to discover on their own. I only hope to convey how it impacted me. 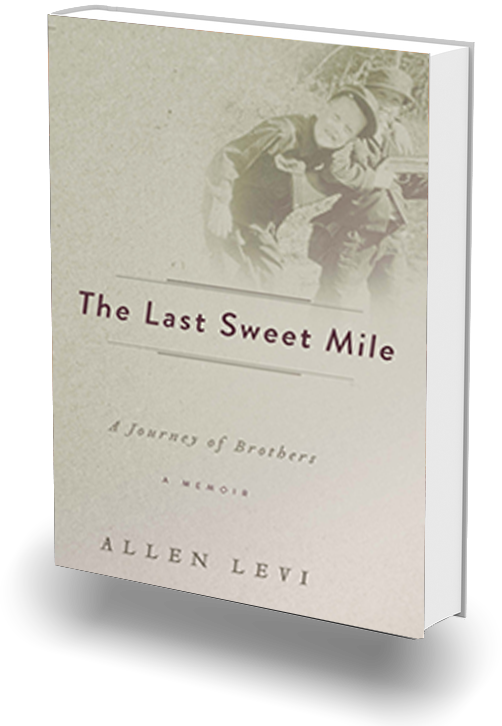 The Last Sweet Mile is a book about brotherhood, endurance, and despising the shame of death. It is written by Allen Levi regarding his late brother, Gary, who was diagnosed with inoperable brain cancer. Now let me stop there. I’ve probably already lost some of you. I understand the apprehension towards reading a book about such a sad topic. But stick with me, because that’s nowhere near the heart of this book. The book began as a letter from Allen to his family, but as he got further into writing the letter, it grew and grew until finally he realized it might be more suited as a book. The plot is mostly built around Allen’s reflections on his brother’s life, some during his final year battling cancer, others from the years prior. Told mostly through memories of their experiences together, the book—in its finest moments—is really a portrait of the enduring faith of brotherhood. It speaks of brotherhood being a holy gift, and after seeing the relationship of these two, I can see what the author meant by that. Their relationship was and is truly a remarkable one. Stories are told of their experiences together through the years that deepened their friendship, but the accounts of their time spent during Gary’s cancer season are haunting and incredibly intimate. One such account goes like this. On our first night here, Gary and I slept in an unpartitioned room that serves as a dorm room when we have lots of family together. The following morning, very early, I could hear Gary crying, a hard troublesome cry. When I whispered to ask if he was okay, he got out of his bed, walked to my side of the room, and knelt down, sobbing. He had had very dark dreams and was frightened and anxious. I held him while he cried and tried to put his mind at rest. Moments like that seem almost too real, too close. Thankfully, moments like this one are a rare presence in this book. But what makes them readable, and dare I say welcomed, is the irresistible hope that is present in the brothers’ relationship, as well as in Allen’s writing. If this were merely an inspirational book about the power of brotherhood and faith in the midst of heartache, I’m sure I would’ve appreciated it, but to say that that’s all this book offers would be a tremendous disgrace. The power in the storytelling comes from Allen’s perspective as he recounts everything. He goes into great detail about the simplest moments, including inside jokes that he and his brother had been keeping for years. Instead of abstractly detailing the beauty of their relationship, he invites the reader into their relationship. You get to see the way his brother looked at the world, and through his narration, you get to see the way he views it as well. My favorite part of the book is near the end, and surprisingly, it’s the portion dedicated to his brother’s burial. I’ve experienced the feeling of losing a loved one, and I’ve also experienced the feeling that comes in the atmosphere of a graveside service. It’s a helpless feeling, as if you have been robbed of something that you can’t reclaim. There’s confusion of how you should feel, and everyone seems to have a different opinion. Reading Allen’s description of his brother’s burial was like fresh air for the soul. It wasn’t simply encouraging or uplifting. It tapped into the shameful feeling of not knowing how to feel in those moments. Since the children have flesh and blood, [Jesus] too shared in their humanity so that by his death he might break the power of him who holds the power of death—that is, the devil—and free those who all their lives were held in slavery by their fear of death. Did you catch that? Jesus scorned the shame of the cross. The shame of death; death which wasn’t a part of the good creation but came as a result of the fall. In their burial practice, they embraced this fact. They fixed their eyes on Christ and scorned the shame of death, the shame of burying a loved one. Moments like this in the book are what make it far deeper than simply uplifting. The faith of that group of men was tangible. It was something they could share with one another, something they could use. It could be seen in their actions. As I have stated before, The Last Sweet Mile is a book to treasure and ponder. It’s a fairly short read, and it’s a very engaging one as well. I can’t recommend it enough, as it has had a profound impact on me.